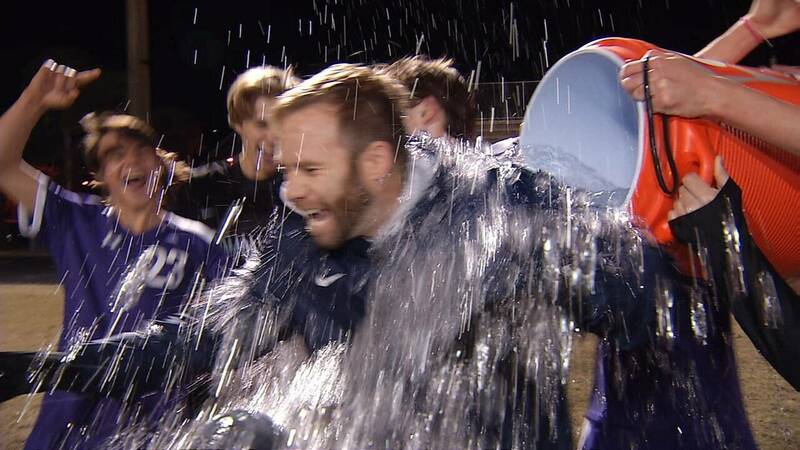 Fletcher Senators head boys soccer coach Rob Holstein gets a ice water bath after his team advanced to the state final four after a 4-3 win over Leon Wednesday night. JACKSONVILLE BEACH, Fla. - When the Fletcher Senators went into the locker room tied at 1 with state number 1 and nationally ranked Tallahassee Leon, head boys soccer coach Rob Holstein knew that his team had a chance. "We knew that if we could score first in the second half, we would have a shot. We haven't given up many goals this year, so we knew that would give us a really good chance," Holstein said right before his team drenched him in a congratulatory ice water bath. Just seven minutes into the second half, Van Slabicki put the Senators ahead as his diving header from a James Schaefer throw in found the back of the net to make it 2-1 Fletcher. Five minutes later, it was Schaefer with his 2nd goal of the night. The free kick from 25 yards out was the goal of the night, hitting the upper 90, making it 3-1. The Senators scored their 3rd goal in 10 minutes as Marcus Van Liere headed home a free kick from Marcus Bolwell to make it 4-1 as they would hold on for the 4-3 win over Tallahassee Leon, advancing to the state final four. "I always thought we had a chance but I didn't know we were going to come together like this," said James Schaefer. "It has been amazing watching everyone grow and the team get better as a whole." The Senators next travel to Auburndale for the class 4A state semifinal on Saturday at 7. A hat trick from the Sharks James Morales punched Ponte Vedra's ticket to the class 3A final four with a 3-1 win over Panama City Arnond, who were ranked number 10 in the nation.